Left panel of a diptych. 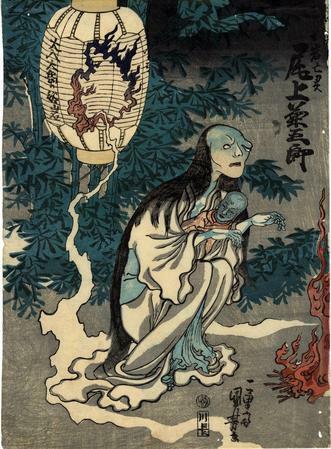 Onoe Kikugorō who specialized in supernatural roles, seen here in his most famous ghostly part as Oiwa, in the production of Yotsuya Kaidan at the Morita ya in the 7th month of Tempo 7 (August 1836). ex C. H. Michell collection ex B. W. Robinson collection. This example illustrated full page in Robinson's Kuniyoshi plate 74. Arguably the most famous Japanese ghost story of all time, Yotsuya Kaidan has been adapted for film over 30 times, and continues to be an influence on Japanese horror today. Oiwa was poisoned by her husband lemon, but her hideously deformed specter returned to blight his life. This print commemorates a performance held at the Morita Theater in the seventh month of 1836.